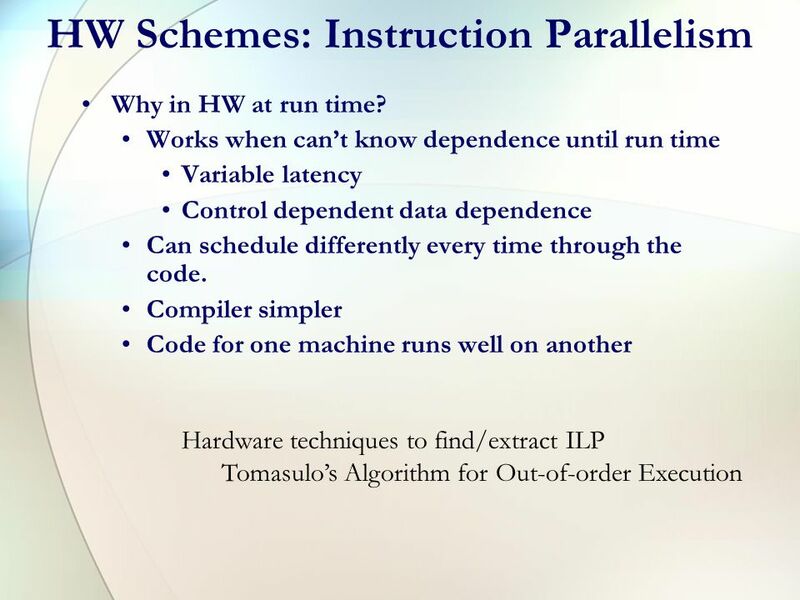 Instruction-level Parallelism Compiler Perspectives on Code Movement dependencies are a property of code, whether or not it is a HW hazard depends on. 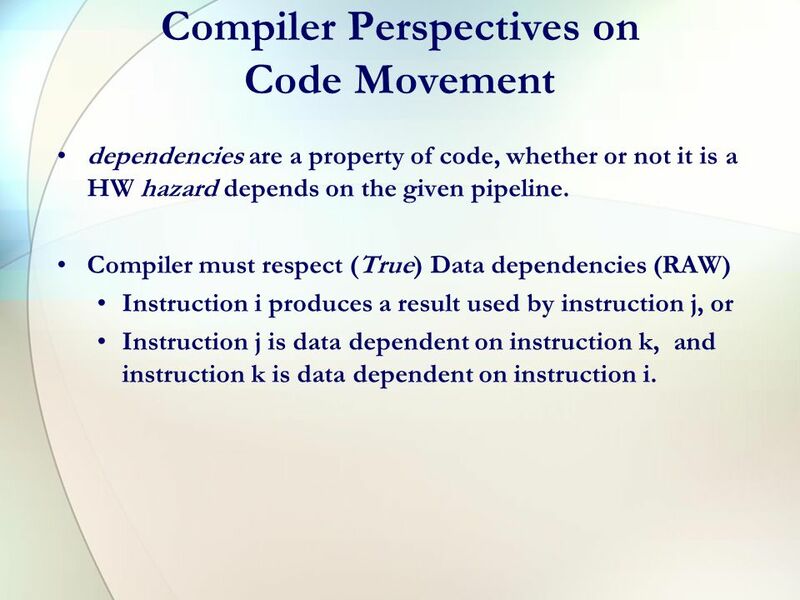 3 Compiler Perspectives on Code Movement dependencies are a property of code, whether or not it is a HW hazard depends on the given pipeline. 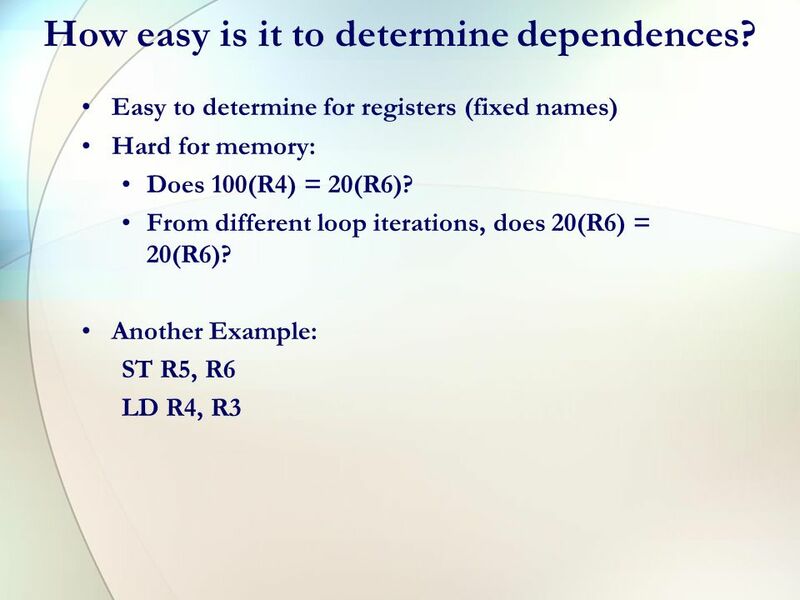 Compiler must respect (True) Data dependencies (RAW) Instruction i produces a result used by instruction j, or Instruction j is data dependent on instruction k, and instruction k is data dependent on instruction i. 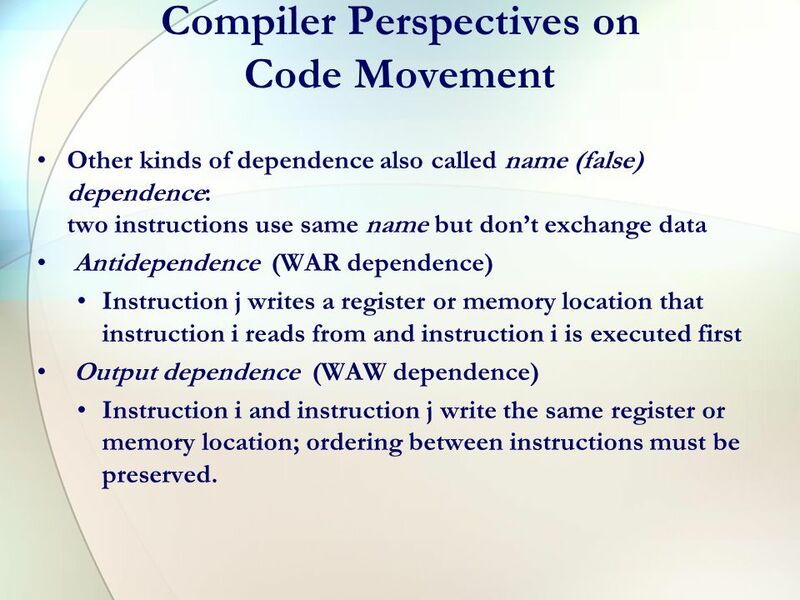 4 Compiler Perspectives on Code Movement Other kinds of dependence also called name (false) dependence: two instructions use same name but don’t exchange data Antidependence (WAR dependence) Instruction j writes a register or memory location that instruction i reads from and instruction i is executed first Output dependence (WAW dependence) Instruction i and instruction j write the same register or memory location; ordering between instructions must be preserved. 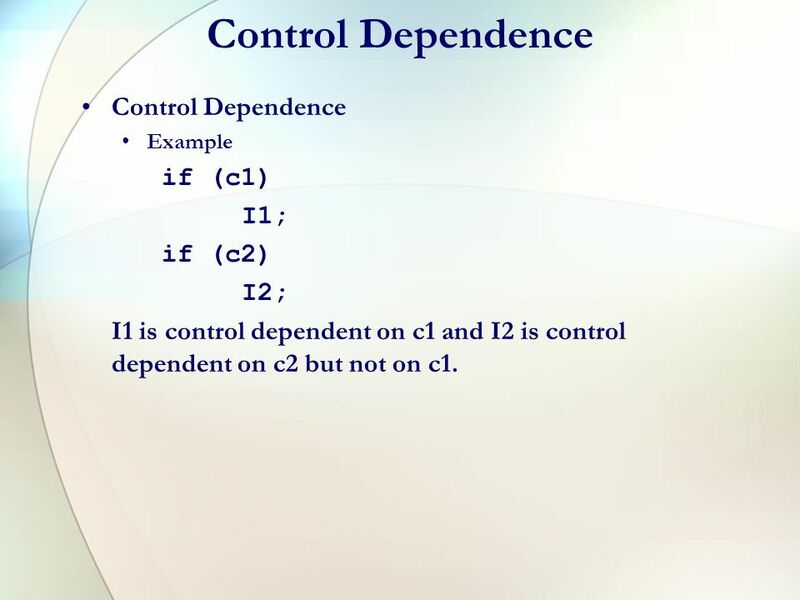 5 Control Dependence Example if (c1) I1; if (c2) I2; I1 is control dependent on c1 and I2 is control dependent on c2 but not on c1. 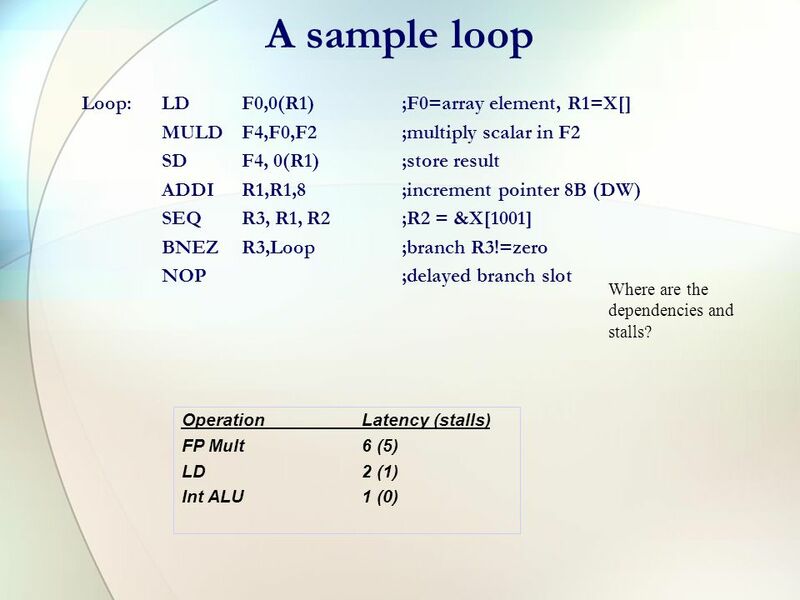 6 A sample loop Loop:LDF0,0(R1);F0=array element, R1=X MULDF4,F0,F2;multiply scalar in F2 SDF4, 0(R1);store result ADDIR1,R1,8;increment pointer 8B (DW) SEQ R3, R1, R2;R2 = &X BNEZR3,Loop;branch R3!=zero NOP;delayed branch slot OperationLatency (stalls) FP Mult6 (5) LD2 (1) Int ALU1 (0) Where are the dependencies and stalls? 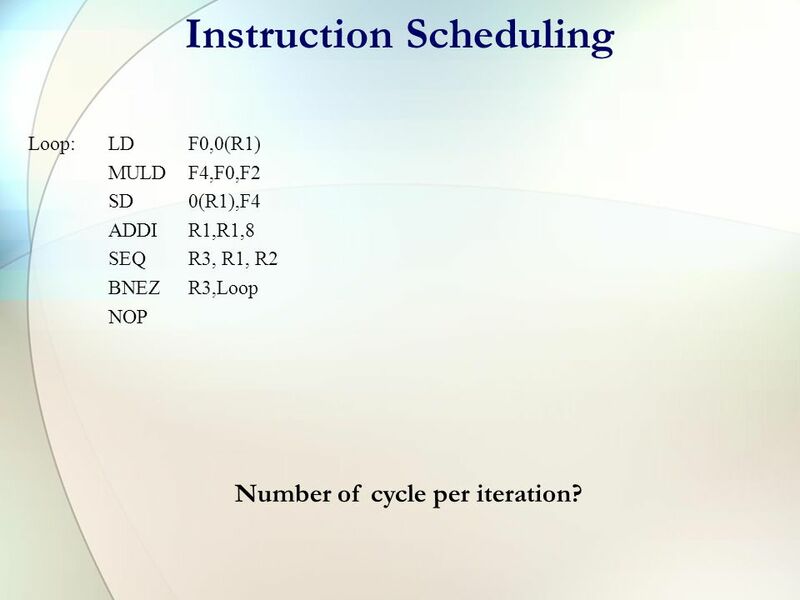 7 Instruction Scheduling Loop:LDF0,0(R1) MULDF4,F0,F2 SD0(R1),F4 ADDIR1,R1,8 SEQ R3, R1, R2 BNEZR3,Loop NOP Number of cycle per iteration? 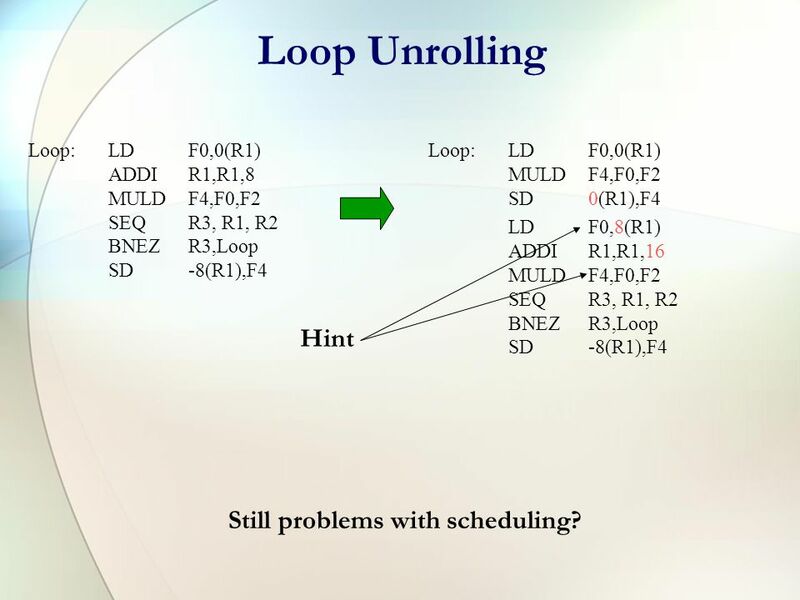 8 Instruction Scheduling Loop:LDF0,0(R1) MULDF4,F0,F2 SD0(R1),F4 ADDIR1,R1,8 SEQ R3, R1, R2 BNEZR3,Loop NOP Loop:LDF0,0(R1) ADDIR1,R1,8 MULDF4,F0,F2 SEQ R3, R1, R2 BNEZR3,Loop SD-8(R1),F4 Cycles/iteration? 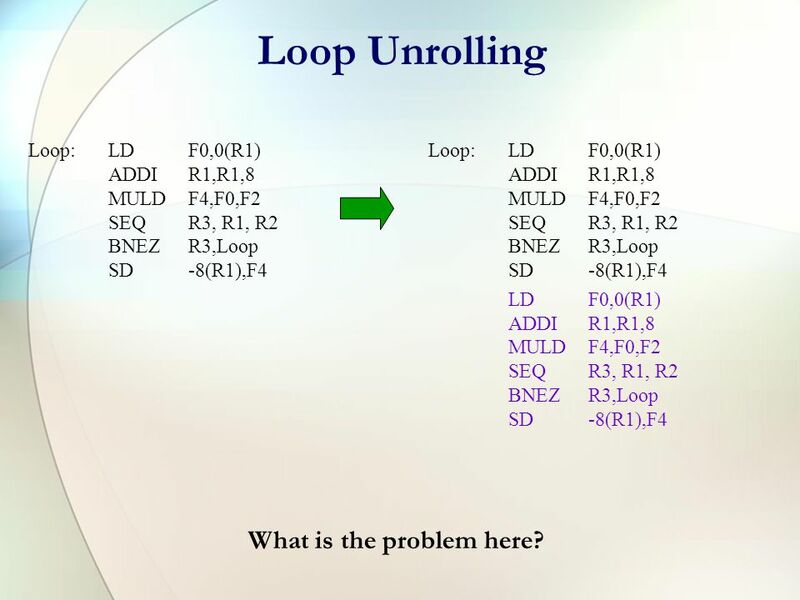 10 Loop Unrolling Loop:LDF0,0(R1) ADDIR1,R1,8 MULDF4,F0,F2 SEQ R3, R1, R2 BNEZR3,Loop SD-8(R1),F4 Loop:LDF0,0(R1) ADDIR1,R1,8 MULDF4,F0,F2 SEQ R3, R1, R2 BNEZR3,Loop SD-8(R1),F4 LDF0,0(R1) ADDIR1,R1,8 MULDF4,F0,F2 SEQ R3, R1, R2 BNEZR3,Loop SD-8(R1),F4 What is the problem here? 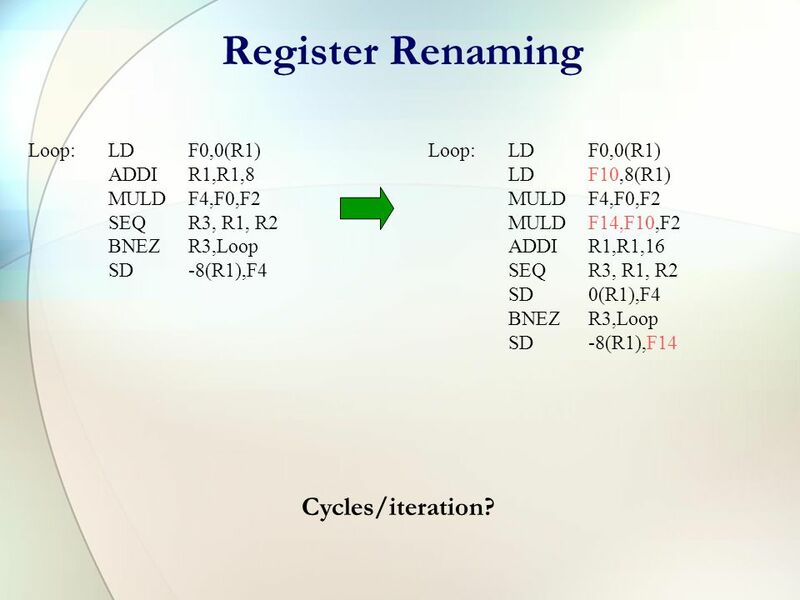 14 Register Renaming Loop:LDF0,0(R1) ADDIR1,R1,8 MULDF4,F0,F2 SEQ R3, R1, R2 BNEZR3,Loop SD-8(R1),F4 Loop:LDF0,0(R1) LDF10,8(R1) MULDF4,F0,F2 MULDF14,F10,F2 ADDIR1,R1,16 SEQ R3, R1, R2 SD0(R1),F4 BNEZR3,Loop SD-8(R1),F14 Cycles/iteration? 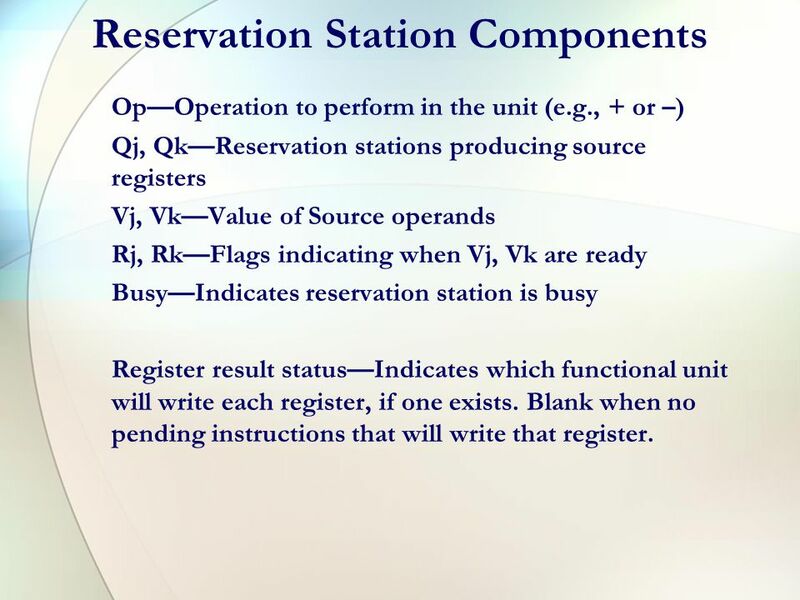 22 Reservation Station Components Op—Operation to perform in the unit (e.g., + or –) Qj, Qk—Reservation stations producing source registers Vj, Vk—Value of Source operands Rj, Rk—Flags indicating when Vj, Vk are ready Busy—Indicates reservation station is busy Register result status—Indicates which functional unit will write each register, if one exists. 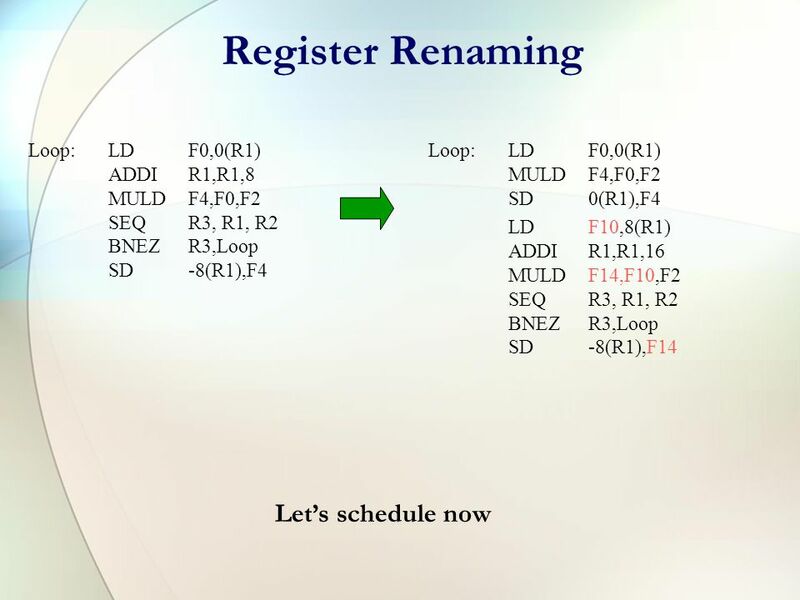 Blank when no pending instructions that will write that register. 23 Three Stages of Tomasulo Algorithm 1.Issue —get instruction from FP Op Queue If reservation station free, the scoreboard issues instr & sends operands (renames registers). 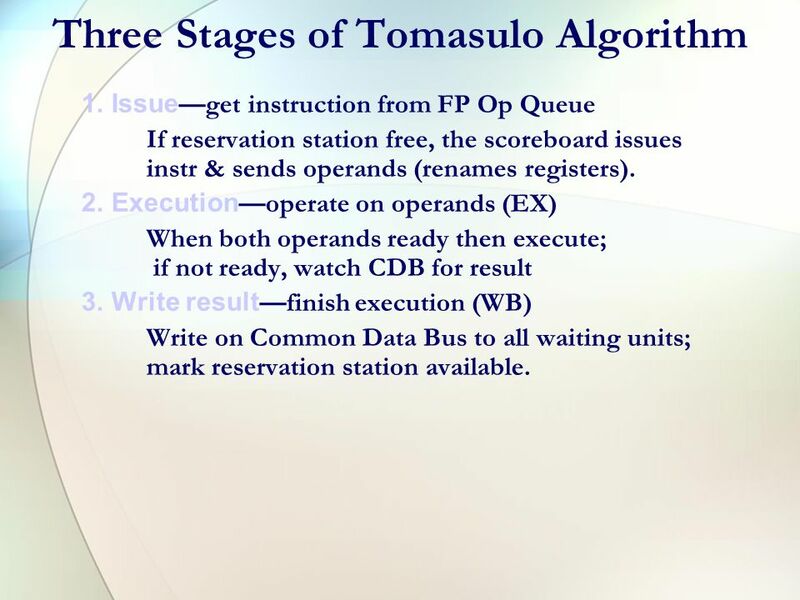 2.Execution —operate on operands (EX) When both operands ready then execute; if not ready, watch CDB for result 3.Write result —finish execution (WB) Write on Common Data Bus to all waiting units; mark reservation station available. 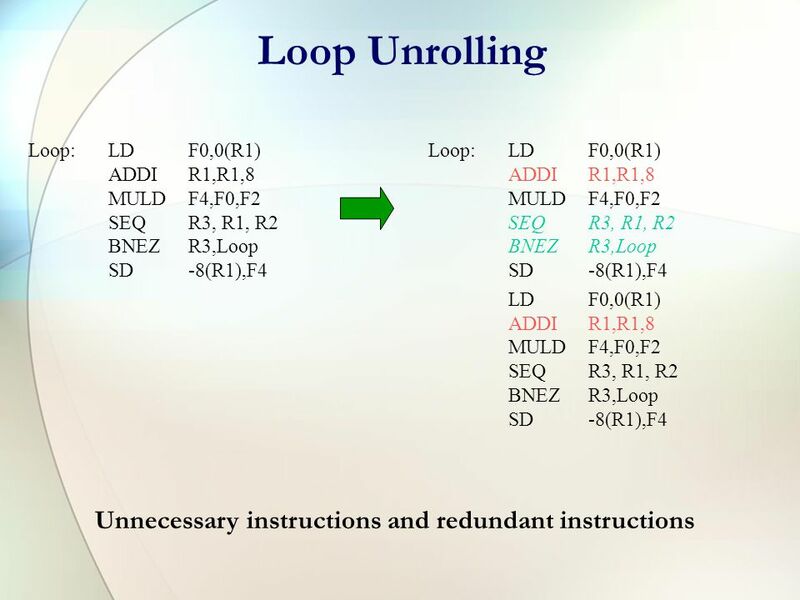 40 Limitations Exceptions/interrupts Can’t identify a particular point in the program at which an interrupt/exception occurs How do you know where to go back to after an interrupt handler completes? OOO completion??? 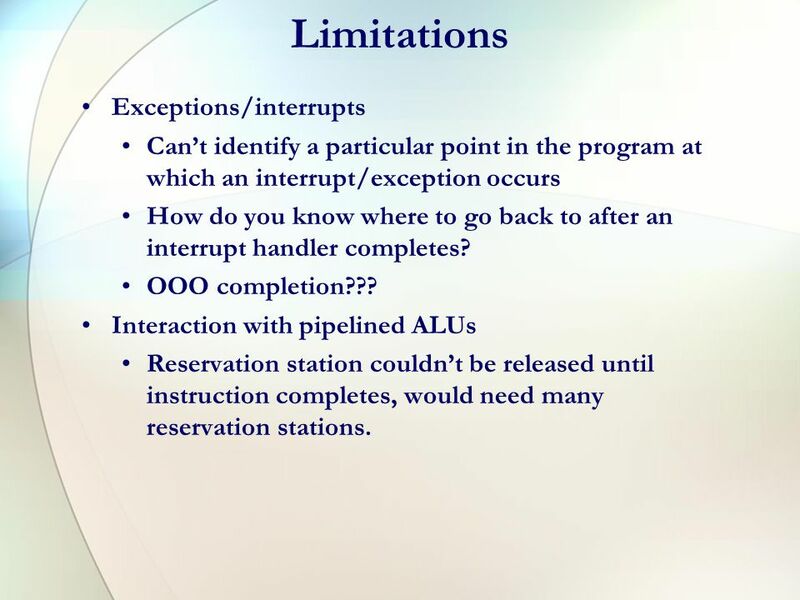 Interaction with pipelined ALUs Reservation station couldn’t be released until instruction completes, would need many reservation stations. 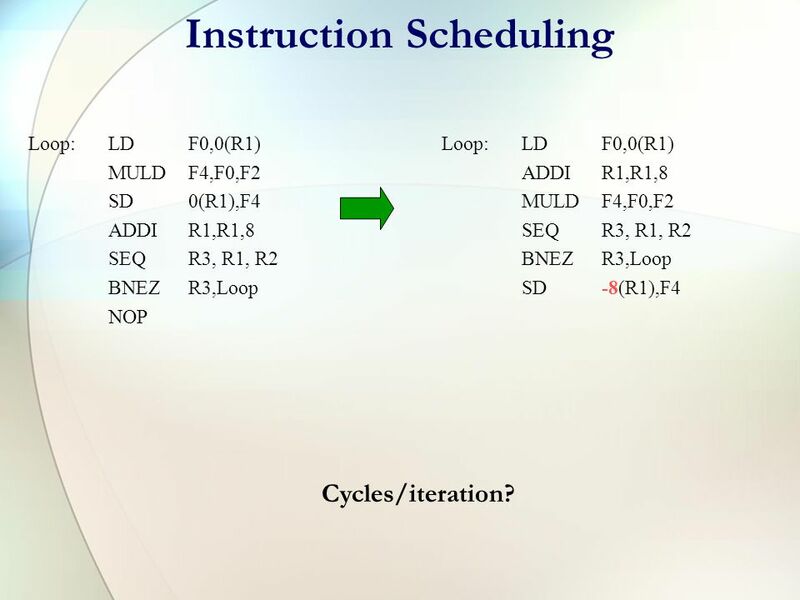 Download ppt "Instruction-level Parallelism Compiler Perspectives on Code Movement dependencies are a property of code, whether or not it is a HW hazard depends on." CMSC 611: Advanced Computer Architecture Tomasulo Some material adapted from Mohamed Younis, UMBC CMSC 611 Spr 2003 course slides Some material adapted. 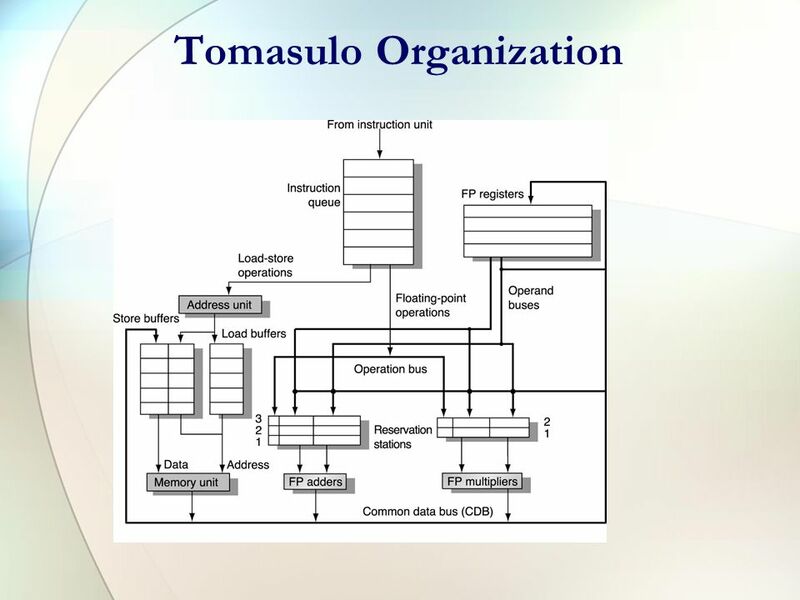 Scoreboarding & Tomasulos Approach Bazat pe slide-urile lui Vincent H. Berk. 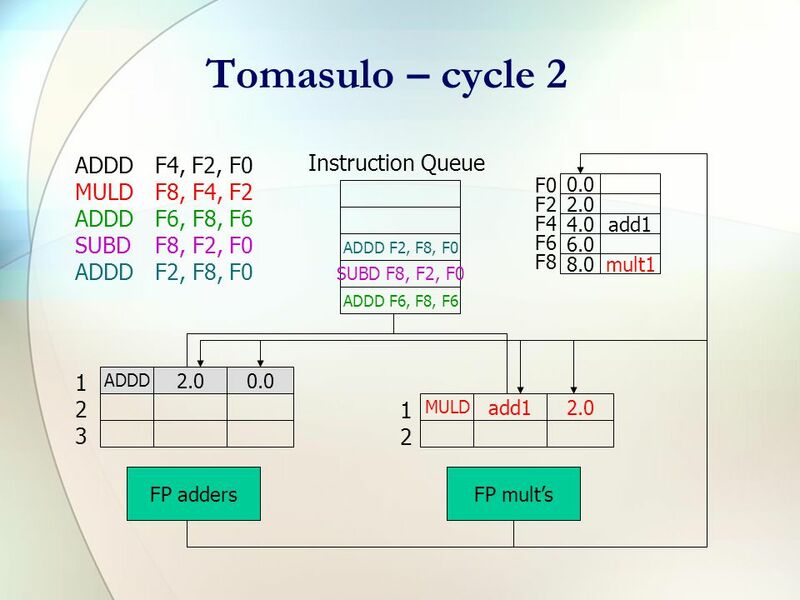 1 COMP 206: Computer Architecture and Implementation Montek Singh Mon., Sep 30, 2002 Topic: Instruction-Level Parallelism (Dynamic Scheduling: Tomasulo’s. Hardware-Based Speculation. 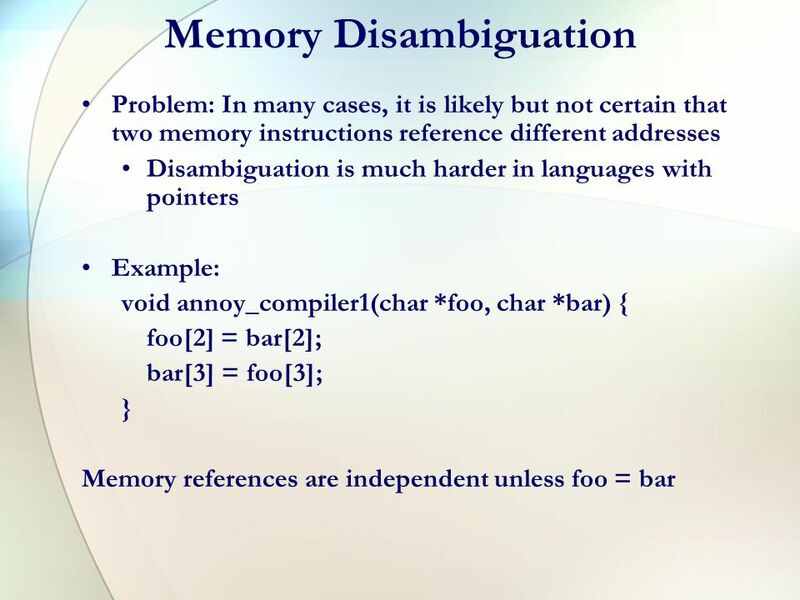 Exploiting More ILP Branch prediction reduces stalls but may not be sufficient to generate the desired amount of ILP One way. 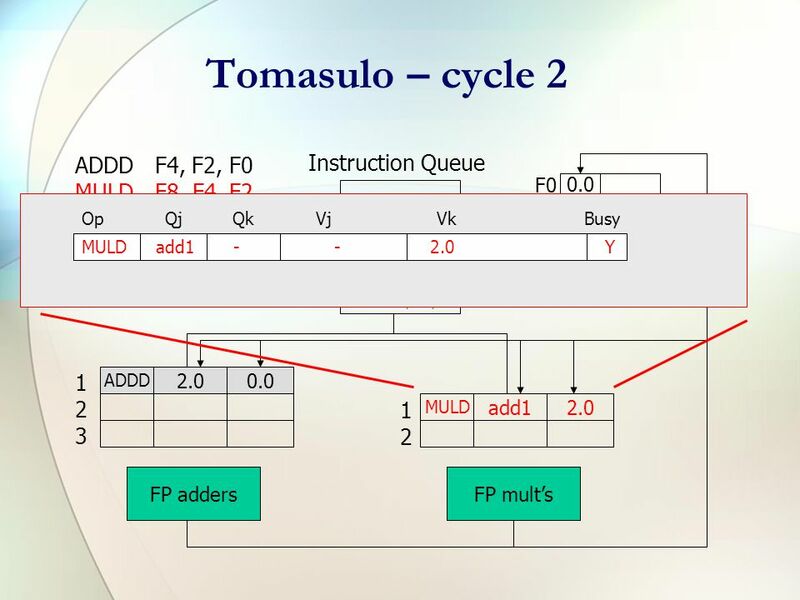 Advanced Computer Architectures Laboratory on DLX Pipelining Vittorio Zaccaria. CPE 731 Advanced Computer Architecture ILP: Part V – Multiple Issue Dr. Gheith Abandah Adapted from the slides of Prof. David Patterson, University of. FTC.W99 1 Advanced Pipelining and Instruction Level Parallelism (ILP) ILP: Overlap execution of unrelated instructions gcc 17% control transfer –5 instructions. 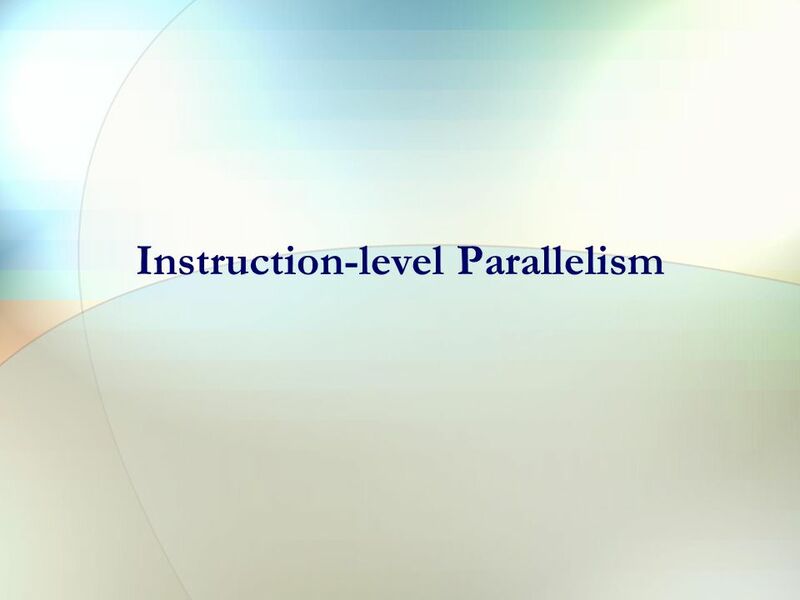 Instruction Level Parallelism María Jesús Garzarán University of Illinois at Urbana-Champaign. Dynamic ILP: Scoreboard Professor Alvin R. Lebeck Computer Science 220 / ECE 252 Fall 2008. 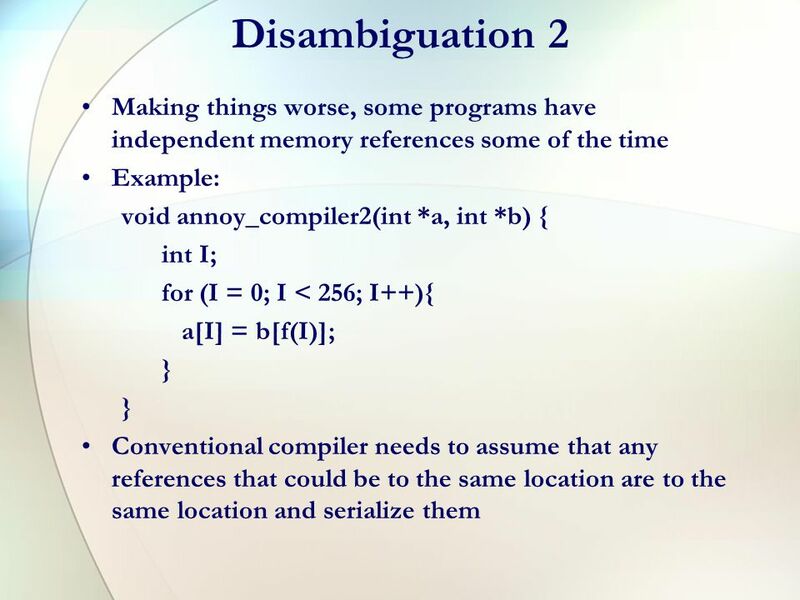 Eliminating Stalls Using Compiler Support. Instruction Level Parallelism gcc 17% control transfer –5 instructions + 1 branch –Reordering among 5 instructions. 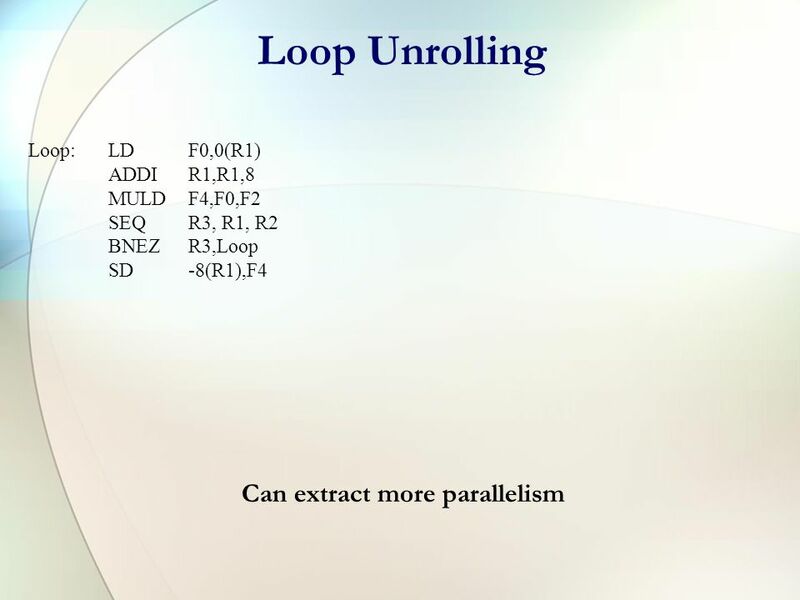 ILP: Loop UnrollingCSCE430/830 Instruction-level parallelism: Loop Unrolling CSCE430/830 Computer Architecture Lecturer: Prof. Hong Jiang Courtesy of Yifeng. Dyn. Sched. 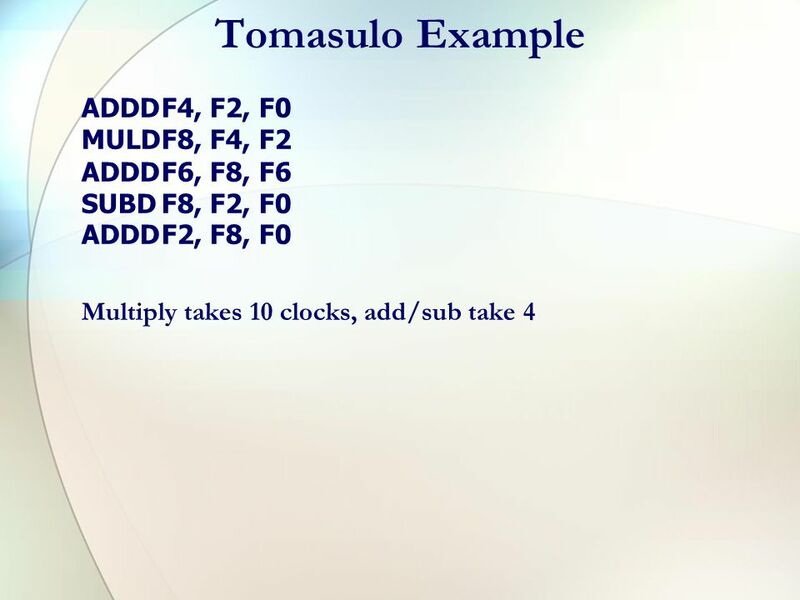 CSE 471 Autumn 0219 Tomasulo’s algorithm “Weaknesses” in scoreboard: –Centralized control –No forwarding (more RAW than needed) Tomasulo’s. 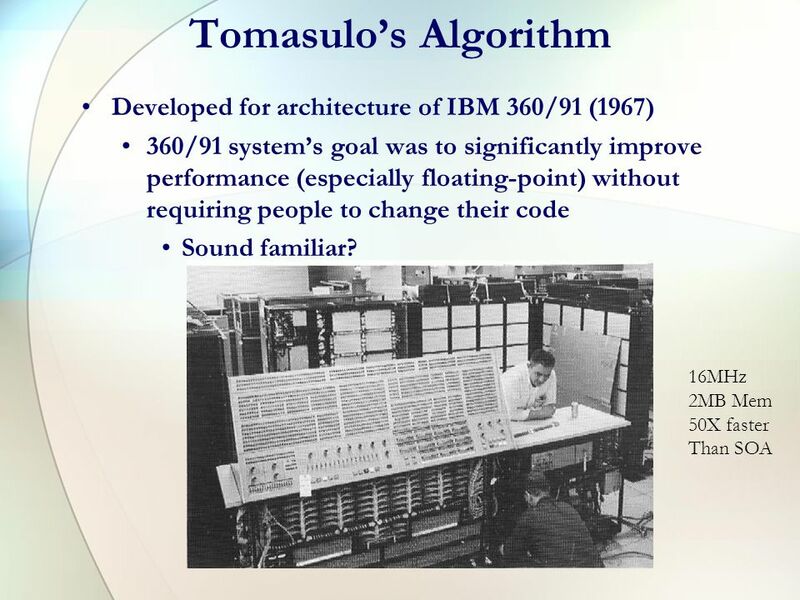 Lecture 6: ILP HW Case Study— CDC 6600 Scoreboard & Tomasulo’s Algorithm Professor Alvin R. Lebeck Computer Science 220 Fall 2001. 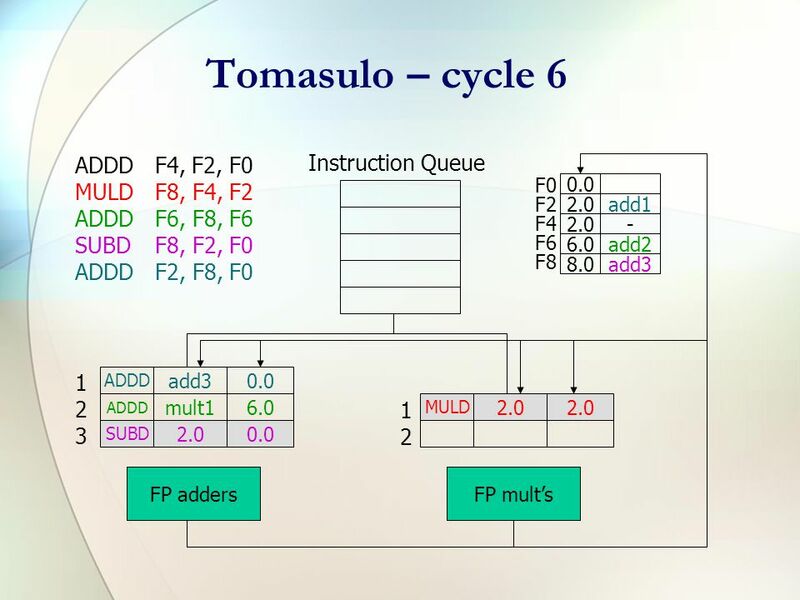 Computer Organization and Architecture (AT70.01) Comp. Sc. and Inf. Mgmt. 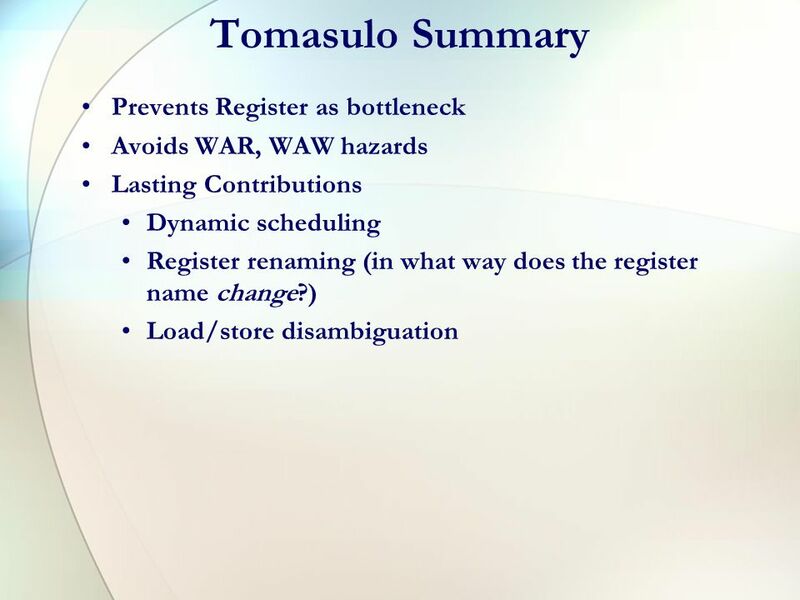 Asian Institute of Technology Instructor: Dr. Sumanta Guha Slide Sources: Based.